You’ve probably heard that eating greens is good for you. A key benefit of eating more greens is the enhancing effect on your immune system health and your body’s ability to fend off infections like Staph and MRSA. In fact, more than any other diet change, Michelle has achieved the greatest benefits to her heath, vitality and immune strength by eating greens in a unique way. Fortunately there’s a new way to eat greens without the bitter taste and unpleasant texture many people find so unpalatable. This method also unlocks the immune supporting nutrients inside the greens and makes them more available to your body. 1. Greens are usually referred to as vegetables, but greens are not vegetables at all. Greens (aka “leafy greens” or “vegetable greens”) include kale, Swiss chard, collard greens, spinach and many other green leafy plants. The vegetable group includes root vegetables (like beets, carrots, turnips etc. ), flowers (broccoli, cauliflower, etc.) and non-sweet fruit (tomato, cucumber, etc.). It would be more accurate and less confusing to put greens into their own food group. 2. Greens are the only food group that most completely matches the nutritional needs of humans. Despite this fact, most diet plans and food pyramids hardly mention greens. 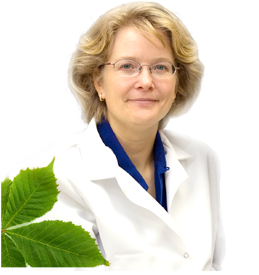 Even vegetarian and raw food diets give little attention to green leafy plants. Some of the unpopularity of greens probably has to do with their taste and texture. 3. Surprisingly, greens can be enjoyed without eating salads, stir fry or any of the other familiar and often unpopular recipes they are most known for. As you’ll see below, there is a more nutritious and better tasting way to enjoy the health benefits of greens. Lean and Mean Protein. Contrary to popular belief, greens are one of the best sources of protein. Amino acids are the building blocks of proteins and they are abundant in greens. In fact, eating a variety of greens in your diet will cover all of your essential amino acids in abundance. For example, one pound of kale contains similar or larger amounts of protein and essential amino acids than the Recommended Daily Allowance (RDA). The protein in greens is simple, in the form of the individual amino acid building blocks. This makes it much easier for your body to build the exact proteins that it needs starting from the basic raw materials. In contrast, the complex proteins found in meat and animal products are hard to digest and break down and can actually contribute to food allergies, immunological disorders and other health problems. Fabulous Fiber. 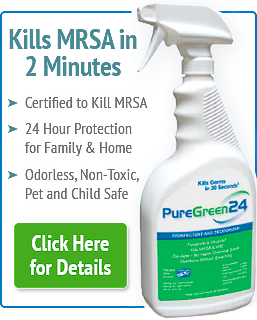 The abundant insoluble fiber in green leafy plants is a critical component of your body’s waste and toxin removal system. Insoluble fiber acts like a sponge and can absorb many times its own weight in toxins and help your body eliminate them. And getting lots of fiber is one of the best ways to boost your immune system, since most of your immune system is located in your digestive system. Packed with Vitamins, Minerals and Antioxidants. Greens are rich in vitamins, including vitamin K, E, A, C, and many B vitamins. Greens also contain a wide variety of minerals and important phytonutrients. 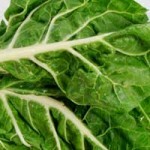 Calorie for calorie, greens are the most concentrated source of nutrition of any food. The greens of plants usually have much higher vitamin and mineral contents than the roots. Carrot tops, for example, have several times more nutrition than carrot roots, but the tops are usually thrown away. Each type of green has its own unique nutritional profile. If a nutrient is low in one type of green, it is usually abundant in other greens. Therefore, consuming a variety of greens in your diet is the best way to maximize the nutritional benefits of greens. Superior Nutrient Absorption.The most unique advantage of the recipes below are their ability to supercharge your absorption of the nutrients in the greens. Even people with digestive challenges can absorb surprising amounts of key nutrients with these recipes. The key to the superior absorption is the breaking up of the raw greens during blending, as you’ll read more about below. Enzymes that Ease Digestion. Unlike many vegetables which can cause fermentation and gas if eaten with fruits, greens actually aid digestion by stimulating your body to secrete digestive enzymes. So greens can be successfully combined with any other food. Infection Fighting Immunity. It you take a look at any acid-alkaline food chart, you’ll see greens are one of the most alkaline of all foods. Raising your body’s pH by eating an alkaline diet is one of the best ways to support your natural immunity, raise your energy levels and support the beneficial bacteria in your gut. So adding more greens into your diet will not only elevate the nutrition your body receives, but it also will boost your immune health, speed your body’s healing response and ramp up your resistance to infection. Eat organic greens to get the highest nutrient contents and avoid extra toxins. Fresh non-wilting greens are much more nutritious than greens that are past their prime. Growing your own greens or buying locally is the best way to ensure freshness and maximize the nutrients in greens. Eat greens raw. Cooking breaks down and destroys nutrients in food. And the hotter the cooking, the more nutrition is lost. That being said, low temperature cooking, such as steaming, preserves much of the nutrition in greens. Adding greens to soup or stew toward the end is another great way to preserve much of the nutrition while cooking. Eating greens raw and uncooked is still the most nutritious option. Although salads and wraps are good for you, eating green smoothies provides much more nutrition and tastes great too. Plant cells are made of cellulose, a hardy and difficult material to digest. The tough cellulose has to be ruptured in order to get the nutrients out. You rupture the cellulose cells walls in greens when you chew them. However, most people have weak chewing muscles and also have chronically low stomach acid from eating processed foods. The combination of tough cellulose cell walls and the reduced ability to chew and digest greens means that most of the nutrients in regular greens are never even absorbed by your body. So how do you get all of the nutrition out of greens? The answer is to blend them – and there is a secret to doing this. Using a blender breaks up the greens into very small pieces that require less stomach acid to digest and get all of the nutrients out. And blending leaves all of the nutrients intact. The secret to blending greens is to blend bananas and other fruit together with the greens into a smoothie. The combination of greens and fruit creates the perfect balance of taste: not too sweet, not too bitter, with the pleasant smell and taste of freshness. It’s important to use a good blender for making green smoothies to break the greens into very small particles (less than a millimeter). 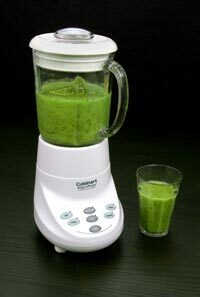 High power blenders specially designed for making smoothies work best. The ultra high speed Vitamix blender is the top of the line for making smoothies. You can also get good results with the Cuisinart Smooth Operator blender, so long as the blades are kept sharp and you finish blending with the high speed setting. Green smoothies provide many times more nutrients than simply eating raw greens. Because smoothies are such a powerful source of nutrition, it’s important to start out slow and give your body time to adjust. If you begin eating too many green smoothies to often, the bacteria in your gut can produce extra gas until they get used to things. And your body may begin to “clean house” and release long-held toxins if you begin getting better nutrition. So start out with a small green smoothie each day and after a few weeks, increase the size of frequency slowly if you like. Below are a few green smoothie recipes. You can substitute other greens or make your smoothie thick or thin by using more or less water. You can even add a few ice cubes to make a cool smoothie. Add a drop or two of essential oils, like peppermint, for a twist. Be creative and experiment. To learn more about how green smoothies can change your health, including testimonials, recipes and green smoothie case studies, we highly recommend the book Green For Life by Victoria Boutenko. Your immune system is a potent weapon against infection. How can you support your natural defense system?